The funny thing about writing a testimonial for Bikram Yoga Bay Ridge is that when I think about it, over the past few months I've been giving testimonials on an almost daily basis. Bikram yoga has quickly become one of my favorite topics of conversation, and I find people to be exceedingly inquisitive about the yoga in general. 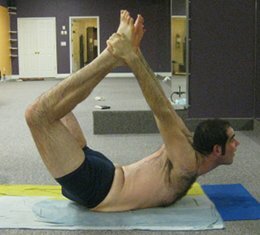 It seems most people have this peripheral awareness about Bikram yoga, they've read something about it in passing. "My cousin's friend does that!," I'll here from time to time, usually followed by "wait, how hot does the room get?" But for those who know me best, the true testament of the yoga is more in my changed demeanor than in anything I say. Today, December 10, 2011 is officially my 157th day of practicing Bikram yoga in Bay Ridge. 158 classes in 157 days. No doubt I had a lot to be proud of before I ever stepped into the Bikram yoga studio, but laying down my mat and towel for that first class was a big deal. I didn't know what to expect, and class number one was a whirlwind to be sure, but as I drove home that humid July night still dripping and still wearing my sopping wet shorts from class, I was sure I had found exactly what I was looking for. But healthy choices cultivate health. So I had some especially rough patches and two years ago I decided to start making some simple heathy choices. Eat healthy and exercise. Simple. The scary thing about making these choices, for me at least, was letting go of all the judgements I had become so attached to. All of these mental constructs and barriers I had built up needed to fall. And so I went from being one hundred percent sure about everything and everyone, supremely pseudo-confident within the confines of my comfy little cave, to completely exposed. I couldn't jog, but I could walk, so I walked. And when I would see a jogger whizzing by me in great shape the same old snap judgements would fire, something to the effect of "expletive expletive expletive, go choke on some wheatgrass!" But day after day, week after week, month after month I stuck with it, and slowly but surely, the intensity of and attachment to my judgements began to wane. 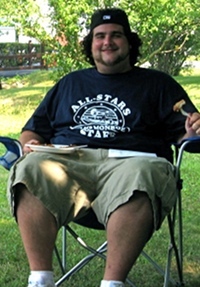 Fast-forward a year and a half and some 150 pounds lost. On July 6th, 2011 I make the choice to enter the Bay Ridge Bikram studio for my first class. And even though my mentality has changed over the course of my weight loss, stepping into such a different environment is very unsettling. I remember the nerves, and the intimidation. But something funny happened about five minutes after I set up my mat in the hot room; I take my teeshirt off... and no one seems to care! A few minutes later, I start fumbling and flopping through the standing series... and again, no one seems to notice. Everyone is just focused on themselves in the mirror, listening to Katie's instructions and trying their best. So after playing the 'how much longer can this possibly go on for' game in my mind through the floor series I make it out of my first class. All of the uneasiness, the feelings of intimidation are gone, and I have this overall sense of calmness that is completely new to me. Since that first class I have exited the hot room 157 times and I have felt that peace every single time. Certainly my body has improved. I have lost an additional 20 pounds and every muscle group has tightened up significantly. I have better balance and flexibility and strength. But for me the mental benefits are really what make the yoga worthwhile. When I let go of all the distractions and all the judgements all that remains is my focused present self, just me and the hot room and the yoga. I started my Bikram yoga practice in November 2009. I was introduced to it because I was looking for something that could help me manage my peri-menapausal symptoms. I felt I was too young to be going through this and I want to tackle this problem head on. After a month of practice I noticed my PMS symptoms were gone, then my allergies and eventually my peri-menapausal symptoms. I was feeling strong and fit after practicing over a year between 3 to 5 times a week. During that period I had completed two 30-days challenge and then my husband and I decided to add another addition to our family. It didn't take long and I attribute this to doing yoga (the eagle pose especially) and throughout my whole nine-month pregnancy I did the pregnancy postures 3x a week. I felt great and never too hot in the room but whenever I felt slightly overwhelmed I was able to leave the room and I think I only did that a few times. 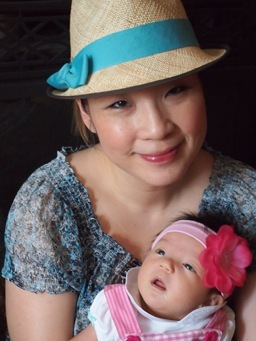 My OB/GYN was very impressed with my health and how my baby was developing. I practiced all the way to the day of my delivery. I did the 6 a.m. class and had my daughter that same night. 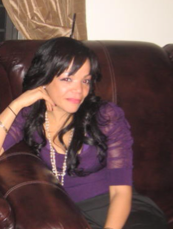 I had my son 8 years prior and my postpartum was not an easy one. I was both mentally and physically drained from the whole experience and it took me over a year to recover. This time I delivered my daughter drug free and from active labor to delivery all under four hours. I was walking the same day and while I stayed home for a month after delivery, I was feeling much better after two weeks. I started the yoga practice 5 weeks after the birth of my baby and will continue to incorporate some pregnancy postures in my practice until I feel 100% recovered. Bikram yoga has helped me to understand myself and my body so much better and I feel everyone should be doing it. My baby is also calm and easy going I think it is also has something to do with the yoga. I wished I had found Bikram yoga earlier but I am glad Nancy brought Bikram yoga to Bay Ridge and it really has improved the quality of my life in so many ways. I practice 5 times a week. No, I haven't done any other kinds of yoga. Bikram Yoga Bay Ridge has nice and friendly yoga practitioners and teachers. It is a nice community. I have made many new friends. I really like Bikram Yoga. I think this the best yoga for me and someday I would like to become a yoga instructor. Profession: I was a paralegal for 5 years. I was searching for a workout that not only challenged me physically but also mentally! After doing some research I was very Intrigued by the whole "hot yoga" concept, so I decided to try it and I never looked back! Yes Dahn yoga. It wasn't challengIng enough for me! 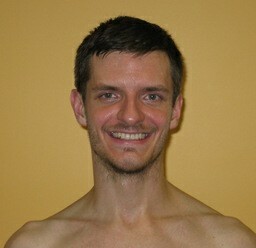 You recently registered for the BIkram Yoga Teacher TraInIng In Spring 2011. What made you decide to become a teacher? I decided to become a teacher because the passion I have for this yoga is something I would like to share with others! I would love to help others change their lives/health by practicing yoga! To inspire others, in the same way I was inspired. Has your decision to become a teacher affected your personal yoga practice? No, I still give 100% in all my practices! Are you lookIng forward to becoming a yoga teacher? The results! The positive changes it brings to your life! I think the best thing about Bikram Yoga Bay Ridge is that members have made a little community of this little place! We have made friends, everyone is just so nice and friendly! I just love it! To stay focused! And flexibility! Ooh where do I start? Physically, my skin is always glowing (it's like getting a daily facial). This yoga has made me a stronger person physically and mentally! I learned not to be so judgmental with myself. When I first started practicing this yoga I was so judgmental with my life and it showed in my practice. My whole class was a big argument with myself. I kept telling myself "But why can't I do this pose? Why am not flexible? Why do I get tired so early in class? blah blah blah..." so, I never advanced! But the moment I stopped the judging voices in my head, my practice changed. I WAS ABLE TO DO ALL THE POSES WITH NO PROBLEM! So I learned that in life just like in yoga all you need to do is to try your best! I learned to take it easy! I learned to stay focused on my goals! Easy, I just remind myself of how happy I feel when am leaving! Yes, if you are serious about chaging your life... stick around. Don't judge this experience only by taking one, two, or three classes. Come on a regular basis and you will be amazed at the changes you will see! Ooh!! and don't be scared it's ONLY YOGA! This yoga won't kill you it will only make you stronger!! The winter led to a lack of exercise as I generally would run out doors and I was dealing with a few very stressful clients at the time. I was looking for something other then the gym that could benefit my mind, body and soul. I have tried Vinyasa Flow 2/3 a few times as well as some slower forms of yoga. None of them caught or held my attention and love as Bikram has. From the time I started a consistent practice I couldn't imagine a day without Bikram in my life. To teach this yoga ensures my commitment to the practice as well as to learn about it on another level. Additionally, I am firm believer in giving back what was given to me and by becoming a teacher I can do so. I don't believe so. For the most part I feel like I always intend to work hard and do each posture the best I can prior to each class. I am a little nervous, but otherwise I am very much looking forward to becoming a teacher. As mentioned above, I have and continue to receive so many benefits from this practice that I look forward to being able to give back to others. I LOVE the heat as it has always been so calming for me. Initially I thought I wouldn't be able to practice too often because it would be the same class every day, but it's not. Everyday I walk in the doors I have no idea what to expect from my body which keeps me coming back. Additionally, I am very much a Type A person, so the practice adds a much needed balance to my personality. It allows me to let everything outside of the room go and focus on what is going on internally. I love Bikram Bay Ridge! It's a second family to me. The community of students and teachers are so amazing and truly vested in each other's happiness and health. Showing up on a consistent basis and strength, as I was more flexible. Prior to starting my practice, I was a workaholic in a profession that was very stressful and did not leave for any "me" time. I was a huge ball of stress which affected me mentally, physically and emotionally. Since practicing, I have learned to take care of myself again. I am in great shape physically and have learned to "let go" of life on life terms issues that I once allowed to stress me. Now I am able to take a step back and process situations and react according to my best interest. It was hard to stay motivated initially, but during my first 30 day challenge I had to show up regardless of how I felt or what was going on around me. I learned that I always feel a million times better when class is over. Try YOUR hardest, No Expectations, let go of the results and come back tomorrow. I was looking for a more therapeutic practice, and my mother was practicing it already. Yes, I practiced Ashtanga Yoga for 4 years before Bikram. How long did you practice before going to the Bikram Yoga teacher training? I practiced for six months almost every day. How has becoming a yoga teacher affected your personal yoga practice? It has made my practice so much more focused and stronger. I have a much deeper understanding of the postures than before and I am a lot more aware of what the teacher is saying when I'm practicing. I make sure to eat, drink and rest after teaching to make sure I have energy to practice. I know that whatever type of class I have I should always be a good example to the students and to practice the same way I expect my students to practice. Having graduated from Bikram's teacher training I feel like there is nothing I can't do, and if I can't do something, it's just a matter of time before I can. What is your most favorite thing about being a yoga teacher? The free yoga classes, not having to dress up for work, making my own schedule, I can't just choose one!!! I must say though, getting to watch students grow and improve with the practice is the greatest reward. My favorite thing is knowing that I can push myself to my limits and do things with my mind and body that I once thought would never be possible. I love how the practice makes me feel, so focused and determined. There could be an elephant in the room jumping up and down and it won't change anything, well, unless it's running my way. The community of students that the studio has created. Doing the postures! No joke! The spine strengthening series was my biggest challenge, it took me a long while before I actually started doing the postures. By the time we hit the floor I was wiped. I'm a lot more peaceful. Most importantly it has given me a different way of looking at day to day situations, events, and feelings, a different perspective, as if I'm looking from the outside in. I have much more humor about everything, don't take anything too seriously, and my peace is rarely broken. You're competing in this year's NY Regional Yoga Asana Competition. What made you decide to compete? It was always in the back of my head though I never planned to compete this early. It was my fellow teachers who convinced me and gave me the confidence that I needed. I always thought the competition was for people with perfect, amazing postures, but really, it's not. The greatest achievement really is getting on that stage, knowing that you have come so far, sharing your routine for all these people, its more of a personal journey for me. One of Bikram's senior teachers Jim Kallet, once said, "the harder the struggle, the greatest the reward when you achieve it". You appreciate it more. I have been practicing a lot, sometimes even doing doubles, and practicing advanced class as well. I do a lot of additional postures after class, including my 3 minute routine, along with backbends every day. I am up to 30 a day, in preparation for a backbending/coaching clinic that I am attending in January in New Jersey. It is being hosted by the Voorhes studio and Esak Garcia is leading it. He is the male champion from the first Bishnu Charan Ghosh International Yoga Asana Championship. His coach is Mary Jarvis, who has trained some of the recent winners. I am in good hands. How do you motivate yourself to keep practicing and training when you're tired? I just know I will feel worse if I don't practice. I keep in mind that I just have to do my best, and that it's ok if I'm tired.